Home » Criminal Defense Blog » Can Police Use Drug Sniffing Dogs to Search Your Car? Dogs have a much more highly developed sense of smell than humans, so it makes sense that police use them as working animals for a variety of purposes. Canine units can search for missing persons, detect explosive devices, and sniff for the presence of illegal substances. On the other hand, the Fourth Amendment gives citizens the right to be free from unreasonable searches and seizures. If a police officer with a working dog stops you for speeding or some other violation, can the officer use their dog to sniff around or inside your vehicle? It’s important to know your rights. If you or a loved one was charged with a drug crime brought about by a drug sniffing dog search, it’s in your best interest to speak with a Dallas criminal defense lawyer for drug crimes as soon as possible. First, it’s important to understand that the police can’t stop your vehicle just because they feel like it. The law requires them to have a reasonable suspicion that you have committed an offense before they’re allowed to pull you over. Speeding is enough to warrant a traffic stop, so police have the right to pull you over if they observe you exceeding the speed limit. However, to justify actually searching your vehicle, the police also need probable cause to believe you have committed some other crime in addition to speeding. They can’t conduct a search of your car just because they stopped you for going faster than the speed limit or making some other kind of traffic violation. In some cases, a police officer might ask a motorist if they can conduct a search of the motorist’s car. Because some people don’t understand their rights, they might think they have no choice but to consent to the search. This is incorrect. However, if you agree to the search, you have consented to have police search your vehicle, and this could mean that any evidence the police find inside your car could be used against you in a later prosecution. 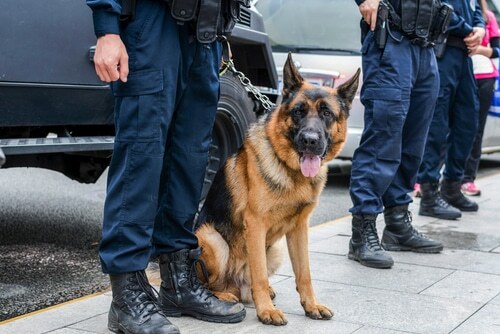 Over the years, the U.S. Supreme Court has clarified the limits and protections of the law when it comes to drug sniffing dogs and privacy rights under the Fourth Amendment. In United States v. Place, the Court held that police could use drug sniffing dogs to search around the outside of airline passengers’ luggage. The Court ruled that police aren’t required to obtain a warrant to conduct these types of inspections because they don’t constitute a search under the law. In Rodriguez v. United States, the Court ruled that drug sniffing searches conducted at traffic stops qualify as searches under the Fourth Amendment. The Court also stated that police must first have a reasonable suspicion the suspect has committed a crime before they can extend a traffic stop long enough to bring in a drug sniffing dog. In Florida v. Harris, the Court considered a somewhat complicated case. Police stopped a man for having expired tags. During the traffic stop, the officer claimed the motorist was acting in a suspicious manner. As a result, the officer called over his drug sniffing dog and had the dog sniff around the outside of the car. The dog signaled that it had discovered some kind of substance around the car’s door handle, which promoted the officer to have the dog search the inside of the vehicle. Although the dog didn’t find any illegal drugs inside the vehicle, it detected pseudoephedrine, which is found in over the counter cold medication. Because it’s also one of the ingredients used to make methamphetamine, the officer arrested the motorist. The motorist appealed his case to the Florida Supreme Court on the argument that the police failed to prove the dog in question had a record of reliably sniffing out illegal drugs. The Court agreed, however, the U.S. Supreme Court reversed this decision, holding that the police only needed to show that the dog had completed the required training to become a drug sniffing dog. According to some experts, there are potential problems with police use of drug sniffing dogs. Like humans, dogs can make mistakes, and even a highly trained drug sniffing dog can make an error. For example, many of the chemicals dogs are trained to detect are found in everyday products like cleaning solutions. If a dog detects one of these chemicals during a search, police might arrest an innocent person. Even if the individual eventually proves their innocence, the criminal defense process can take a serious toll on the person’s career and reputation. Defending yourself against a drug crime can also become costly. This is why it’s important for anyone accused of a drug crime that resulted from a drug sniffing dog search, to speak with an experienced Dallas criminal defense attorney for drug crimes. Your lawyer can help you decide what kind of defense will work best in your case. What Will the Jury Do in My Criminal Case?